Floral Elegance Unlimited offers both fresh and silk flowers. 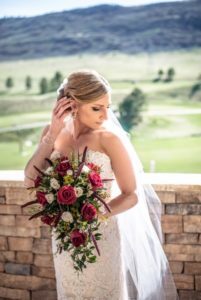 Bridal bouquets include cascades, nosegays, European hand-tied and arm bouquets. Price varies according to seasonality and style. Many brides today are asking for centerpieces for the tables at the reception. We rent some glassware to keep the cost reasonable. From floating a colorful gerbera daisy to a beautifully arranged custom glass centerpiece, we are ready to help you make all your wedding dreams come true! Large glass arrangements of gladiolus and Italian ruscus can accentuate any altar area. Decorating at religious or other venues adds the personal touch that sets you apart from everyone else. Let Floral Elegance Unlimited help you with all the little extras that will turn your wedding from lovely to extraordinary . Please call for a quote and ask about your favorite flowers.